If you’ve still a little Christmas money burning a hole in your pocket, or (perhaps more likely) you’ve just seen your December credit card bill and have given up budgeting as a bad job – then let me help you spend a very few pennies on some shiny new gardening tools. You can tell yourself it’s a noble deed in the cause of tidying the garden, and if Marie Kondo comes round to complain about more stuff, we can lock her in the shed. Long-term readers of this blog will by now be aware that, far from viewing weeding as a necessary but tedious task, I actively enjoy the process – it’s a mindful occupation, forcing you to be quite literally in touch with the land; hands in the soil, breathing in lungfuls of fresh air combined with whatever those friendly microbes are that are so beneficial for our wellbeing (the bacteria Mycobacterium vaccae actually – read more about them here). And as you you get to know the weeds that like your garden, you begin to gain an understanding of the kind of plants that will flourish in each of the areas you tend. In this post I’m going to present you with three tools from Burgon & Ball, each beautifully made and (I’ve found) well-suited to job I’ve been asking them to do – because while a poor workman might blame his tools, a sensible one knows the trouble caused by ill-designed equipment. Tools don’t have to be expensive, or even originally designed for a particular purpose (see guest posts on this blog from Carly Wood and Robbie Blackhall-Miles) – they just have to work well. And that’s something these tools manage with quiet capability. Oddly, cost doesn’t seem to be a reliable indicator of suitability to the intended task. One of the best hand forks I’ve used was less than a fiver when new. One of the worst – eye-wateringly pricey and beautiful to behold – is terribly designed, though as so many pro gardeners rave about the particular marque I can only assume it’s the weak spot in an otherwise stellar range (I’m not in a rush to fork out for any more, though). Burgon & Ball tools sit somewhere in the middle of the price spectrum. I wasn’t sure about this RHS-endorsed fork when the awfully nice people at Burgon & Ball suggested I try it. It’s a garish, fluorescent yellow (also available in pink). But that’s kind of the point – and for a gardener who regularly misplaces tools in the borders, a very visible handle is a sensible idea. The yellow stands out, and sure enough, I’ve never lost it (though it has had to be fished out of the compost heap on more than one occasion when I’ve absent-mindedly left it in a trug full of plant matter bound for that destination). The cord knotted through the handle has reflective strands woven through it, which are handy if you’re squeezing the maximum gardening time out of those short winter days, or at least they were, before the whole thing got caked in mud. After two years of daily use, the paint has worn off the handle (I really should get hold of a tin of fluoro yellow for all my tools) – but this is still the hand fork I reach for first. It’s slightly larger than most, which I find an advantage as, if you work fast and scrabble with your other hand, you can also use it for planting holes in the flinty clay soils which I work – preferable to hand trowels which tend to smear when the ground is wet and fail to make much of an indentation when it’s dry. It’s also the perfect weight – light, but not flimsy – the curve of the tang positions the head at a good offset from the handle (slightly behind the line of your fore-arm – you don’t want it in line with your arm or you’ll be flicking soil everywhere like a mole), and the tines have a slight forward bend a third of the way along their length. All in all, it makes for a really well balanced tool that suits the way I work perfectly. Looking a little battle weary after two years constant use, but still going strong. There’s a lot to be said for an onion hoe – it has a small head, allowing it to be used in restricted spaces – such as between the rows in the kitchen garden. It also has a short handle, which gives a greater degree of control. But not all onion hoes are created equal, and there are many pretty uninspiring, dull-bladed examples on the market. Burgon & Ball market this tool as a Vegetable hoe and include it in their Tough Tools collection – it’s really an onion hoe on steroids. The blade is super sharp and angled slightly backwards, which is essential for a short-handled draw hoe if you’re not to be forced into holding the tool with an uncomfortably crooked wrist. The carbon steel head is double-riveted into the FSC ash handle, the split ends of which are bound with a metal ring to preserve the joint. As well as the hoeing action, it can also be used to chop through roots in the manner of a tiny mattock, and the head is just sufficiently heavy to produce a satisfying thwack at the end of each swing. For me, it truly comes into its own when working a tricky spot in one particular garden, where the weeds sink deep roots into the heavy, rubble-filled clay on top of a ragstone wall. But it’s an equally capable, fast worker in softer soil at ground level, and makes a quick job of tidying up the raised beds at home. Like the Razor Hoe below, there’s a ten year guarantee, which is good, as well as a leather cord through the handle for storage, which isn’t. This is one of my few gripes with Burgon & Ball, who seem rather too fond of leather trims on everything from seed tins to gloves to hand tools, at a time when many brands are recognising a desire in their customer base to move away from animal products. The knot also slips with little persuasion, so it’s likely to need replacing with something a little more efficient (and Veganuary-friendly) before too long. Also from the Tough Tools range, the Razor hoe is probably the most versatile of the hand-held weeders. With what could be described as a swan neck (though the head has rather more of the flamingo about it to my eye), this works as an ultra-efficient draw hoe, the sharp-edged blade, set at right angles to the handle, appearing barely to register the weeds as it slices through all in its path. But the configuration of the tool head means the Razor hoe can also be turned through ninety degrees to slice down into the soil and grapple with roots several inches below the surface, where a particular advantage of the pointed head and right-angle bend makes it adept at hooking itself into a plant from below, allowing you to heave stubborn weeds out of the soil intact. The thin point is also adept at winkling its way between paving slabs, though such abuse will dull the edge with little effort. A left handed version and a long-handled configuration are also available. You wont’t be disappointed with any, or all, of these three tools. If I had to choose one? It’s always going to be the FloraBrite® Hand fork which, together with a pair of secateurs, is rarely far from my hand, doubling up as a planting tool at a push. 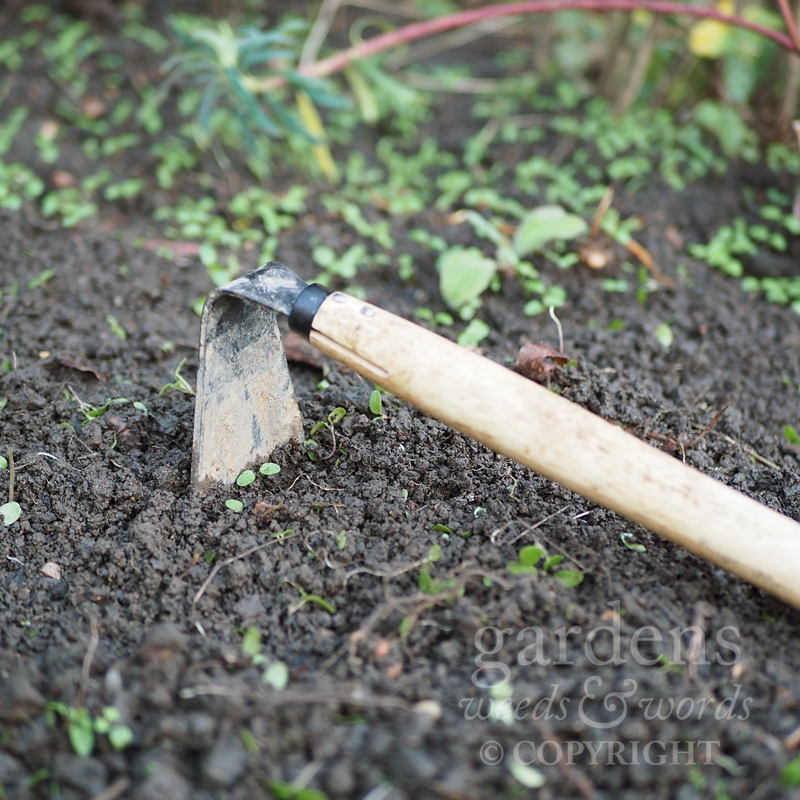 But for weeding large areas it’s not the speediest of tools,and ideally it would be paired with a hoe of some description – I would opt for the Razor hoe for its versatility, although for those situations I’ve mentioned the Vegetable hoe is hard to beat. Both the FloraBrite® Hand fork and the Razor hoe were gifted to me by Burgon & Ball in exchange for a fair review, and the Vegetable hoe found its way into my shopping basket at the garden centre, as these things are wont to do. Hello! I’m Andrew, gardener, writer, photographer, and owner of a too-loud laugh, and I’m so pleased you’ve found your way to Gardens, weeds & words. You can read a more in-depth profile of me on the About page, or by clicking this image.